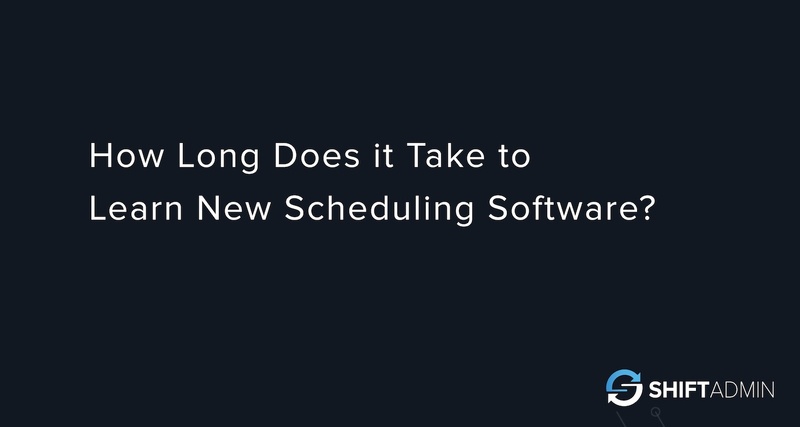 How Long Does it Take to Learn New Scheduling Software? Implementing something new into your organization usually includes a learning curve, i.e., you’ll need some time to adjust to the new system or process before it becomes second nature. That’s certainly true of new software, including scheduling software. If you’re in the process of utilizing new scheduling software in your hospital or organization, you may be worried that learning how to use the program most effectively will eat up valuable time. The bottom line, however, is that the time you spend learning the new scheduling software will save you a huge amount of time in the future. After all, the manual scheduling process you’ve used until now is very time-consuming and involves hours of labor. Learning the ins and outs of your new scheduling software is like almost every new challenge in your life – it’s going to take some time. You’ll go through countless iterations of your algorithm-based software as you strive to create the most optimal schedule. The good news, however, is that these iterations take up far less time than creating a schedule by hand. Giving your providers as much information as possible will help familiarize them with this new system and help them be more comfortable with the changes. The same goes for you! Utilize all training resources, support team, and FAQs to get the most out of your new scheduling software. Education eliminates the dreaded “unknown” factor of adapting to a new process. We recommend finding some uninterrupted time in the beginning to set up providers, jobs, and contact info. You may also need to manually enter a few months of your current schedule (or import it) into the new system. While this one-time set-up process might take a few hours, you’ll be more surprised by how much time your new web-based scheduling software will save you in the long run. Instead of thinking about what could go wrong – especially as you face the challenge of implementing and adapting to new software – be patient and focus on the big picture instead. Work closely with your support team to tweak rules, adjust provider preferences, and manage empty shifts, allowing you to get the most out of your scheduler. You have a lot to do as a group administrator, and yet, you’ll probably have to manage all of those things as you implement your facility’s new scheduling software. When possible, we recommend enlisting the help of others to maintain the status of “business as usual.” Not only will this process help other coworkers see the value of your work and the impact that the new scheduling software will have on the facility, but you’ll be able to fully focus on onboarding your facility to this new platform. The big picture of what you’ll gain with new, optimized scheduling software is everything. And you’ll get a glimpse of this early in the process of onboarding your facility to the software. From the ability to easily handle schedule requests and time-off, to analyzing data that leads to optimal scheduling, you’ll be pleased that you’ve made the transition from manually-generated processes. Switching to a scheduling software provider like Shift Admin enables you to handle even the most complicated schedules in a fraction of the time compared to that of manual scheduling. Better yet, Shift Admin’s support team is with you every step of the way as you learn your new software.